BOLIVAR, Mo.— Authorities have identified three teenagers from Kansas who died Friday when a church van heading for an outing crashed in southwestern Missouri. Samara J. Bayse, 17, Stillwell; Hannah L. Foy, 14, Louisburg and David T. Martin, 16, Olathe, died in the crash just after 10:40 a.m. on Missouri Route 13, five miles north of Bolivar, according to the Missouri State Highway Patrol. Ten others were injured. The van had 13 passengers, mostly teenagers but a few adults, Missouri State Highway Patrol Sgt. John Leuckenhoff said. 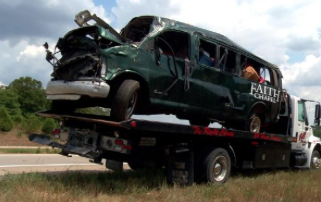 Everyone on board was injured or killed when the van ran off the roadway, struck a tree and overturned. No other vehicles were involved in the accident.